Tired of feeling bloated, exhausted, and overwhelmed by food? Perhaps you have tried multiple diets and lifestyle “resets” or “detoxes” to find your way back to your ideal weight and feeling great. It feels like a never-ending cycle of frustrating dieting and the results don’t always stick. Why can’t being healthy just be EASY? Contrary to popular belief, IT CAN BE. Clever marketing campaigns over complicate eating, promoting the next fad to “lose weight fast”. As a Naturopathic Physician, this upsets me because I often have to help my patients do a lot of “unlearning” of common misconceptions about food. For example, did you know that FAT is actually GOOD for you? That’s correct, the right kind of FAT is GOOD for you, in fact, it is the secret to busting sugar cravings. Crazy, right? 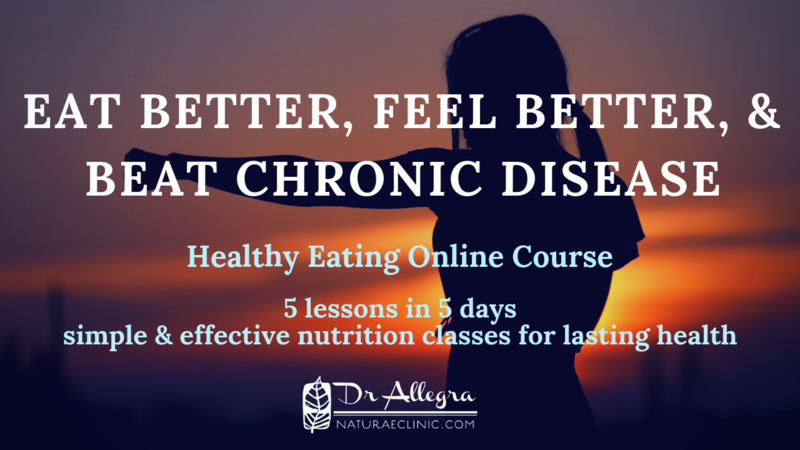 Through this course, I am going to teach you how to use foods like healthy fats to get rid of cravings, reduce inflammation, reset your nutrition and take back your health. I am going to teach you how to stop dieting and start living without anxiety around food. I will teach you how to choose and properly prepare healthy, nutrient dense but also delicious foods your entire family will enjoy. Learn the basics of healthy eating. This is where we lay the foundational information you need to know to start making better food choices. Explore the power of good fat and how it can support your health. Learn how grains, seeds, nuts, and beans steal your nutrients. Learn how to STOP these foods from creating nutritional deficiencies. In case you are wondering, “How does food impact my health”? Half of all adults in the United States have more than one more chronic disease and the number is on the rise. 2/3 of deaths are attributed to chronic diseases such as heart disease, cancer, and diabetes. Obesity affects well over 36% of US adults. These rates are rising every year. This leaves many people overwhelmed and frustrated. The good news is the risks of chronic diseases like heart disease, cancer, obesity, and diabetes can be REMOVED! Even if you have a strong family history of these illnesses, you can reduce your risk and heal the damage that has already occurred with real food. Don't let your family history of chronic disease stop you from having a healthy, happy, thriving life! I believe everyone deserves to know how to choose healthier food and get out of the cycle of dieting to start LIVING. I can help you- in just 5 days, you can reset your health! This course includes the resources I recommend in my private practice to my patients and is worth $197. If you are tired of feeling exhausted, inflamed, are sick of having anxiety around food and are ready to reset your health NOW, I am offering you this course for only $49. No worries, there is a NO RISK 30-day 100% money back guarantee. No worries, there NO RISK with my 30-day 100% money back guarantee.